Hitachi Data Systems (HDS) has come up with a cloud strategy roadmap featuring three cloud tiers, but with precious little product detail fleshing out the strategy. The strategy involves BlueArc and ParaScale's scale-out file system being added to its existing storage products. It's also providing three cloud services either on a pay-as-you-go basis or for traditional purchase. The basic big idea, HDS says, is that you can create a single pool of virtualised block, file and content storage in order to support traditional IT and cloud delivery from a single integrated architecture. In other words HDS is functioning as a stand-alone storage supplier integrating its storage facilities with existing data centre server and networking resources. It is doing this by envisioning a "three-stage journey to an information cloud with data centres transformed into information centres" – all good marketing-speak. The three cloud tiers are an Infrastructure Cloud, a Content Cloud, and an Information Cloud. "Finally, this leads to the information cloud, where we can leverage the dynamic infrastructure cloud and the liberated data in all forms (structured, unstructured, semi-structured) from the content cloud to drive towards sophisticated analysis and insight." HDS claims the Infrastructure Cloud provides a single virtualised platform for all data by converging virtualised server, storage and networking resources that can scale on demand. Our understanding is that this means other suppliers virtualised servers and networking resources as HDS is not in a position yet to include Hitachi servers and networking gear in this concept. There is precious little product detail but we can assume HDS's Hitachi Data Ingestor (HDI) systems linked to core Hitachi Content Platforms (HCP) layered on its storage arrays (VSP) play a central role. HDS's Hu Yoshida describes the Content Cloud's function like this: "The content cloud is built upon the infrastructure virtualisation and goes a step further by virtualising the data from the application and the access protocols. We virtualise the data by ingesting it into a container along with the meta-data that describes it, and the policies that govern it. "This container becomes an object that can be searched, accessed, and repurposed without the application that created it. We virtualise the access protocols through the use of RESTful protocols, so that the content can be accessed through an iPhone or Android on GSM, a tablet on 3G, or a workstation on a LAN. Content can also be accessed through a CIFS or NFS front end, or searched and accessed through a virtual file system on our HNAS high performance filer." The HNAS product is BlueArc's filer. The Content Cloud relies on a BlueArc bridge between it and the Infrastructure Cloud. BlueArc provides a key link between infrastructure cloud and content cloud with its expertise in file-based virtualisation, built-in intelligent tiering and automated data movement capabilities for unstructured data. This acquisition and tight integration with the Hitachi file, content and block portfolio enables customers to gain control of their unstructured data with seamless access, search, retention, consolidation and archiving capabilities. We're told by HDS that it is going to enter the data analytics and business intelligence markets with massively scale-out file systems using its acquired ParaScale assets, as well as its VSP array, BlueArc NAS and other HDS products plus "products in development." The ParaScale scale-out file system can store and process both structured and unstructured data in parallel and at scale. HDS says: "It offers extremely fast data ingest and integrated data movement and search to effectively serve the needs of big data analytics." It also says that information analytics tools and processes can be integrated with the underlying infrastructure. Customers will be able to replicate and combine "previously siloed structured and unstructured data, then applying intelligent analytics [that] will enable organisations to extract and gain increasingly more value from their information". An information cloud will connect data sets, reveal patterns across them and bring to surface actionable information and new insights to business users, which can be used to help solve the world’s most pressing challenges in the fields of health and life sciences, energy research, social infrastructure and more. HDS has also launched three private cloudy offerings that can be paid for on a pay-as-you-go basis: Hitachi Cloud Service for Private File Tiering, File Serving, and Microsoft SharePoint Archiving. They can also be purchased for cash by customers wanting to own the resources from which they deliver the same services. In this case they are called Hitachi Cloud Solution Packages for File Tiering, File Serving, and Microsoft SharePoint Archiving. There are no underlying or component product details available. HDS did say that a cloud management portal is included with these services and packages, providing customers with a self-service interface to access bill, payment and chargeback information. Of course we know that HDS doesn't have its own server and networking resources it can bring to the cloud table, but what it does have is a coherent picture that weaves virtualisation, the cloud, and big data into a coherent story integrated with and layered on its storage products. 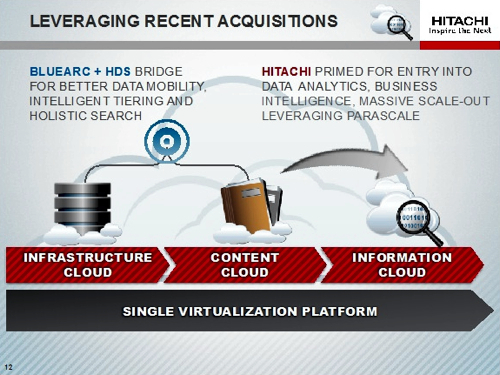 The information cloud offerings are nascent and will need to involve supplier partnerships, which, no doubt, HDS is already working on. Our guess is that it may even involve an acquisition or two.